Facebook has moved from merely being a walled garden into openly attacking its users’ ability and willingness to navigate the rest of the web. Anil’s post explains what I’ve been seeing in the traffic patterns on my blog. When I first started blogging about a year ago, most of my traffic came from Facebook. It made sense, I have a lot more facebook friends than twitter followers. But after the most recent newsfeed redesign at Facebook, their referrals have dropped precipitously. Facebook is on the top of my all-time referer list. Beating out twitter by about 30%. 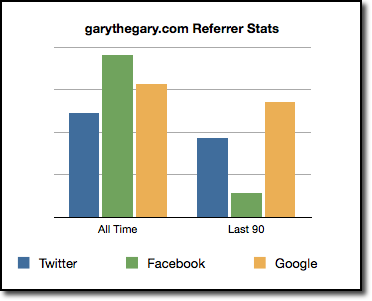 But over the last 30 days, twitter has provided 4 times more referals than Facebook! I would be curious to know if other bloggers have noticed this shift, or it it’s something unique to my particular blend of friends and followers. If this holds true for other bloggers as well I can see a greater push to build communities in other social media sites that are not as aggressive at keeping users inside the walls. ← Failure – Now what?